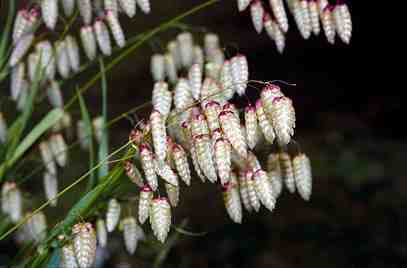 Briza Grass is simply magical…it catches the light in a manner that no photograph could ever do justice. The flower heads turn from a pale green to a deep tan…almost red and they rattle in the breeze…very charming and adds the perfect Thomas Hardy country style to your flower arrangements. It will keep on growing as you harvest it through the season and will reseed the bed for the following year. Bingo! Thin the seedlings closer together than you would most of your flowers…five or six inches is fine.